This outing, a company has come up with a "cure" for being a mutant. Magneto uses it as a reason to mount another anti-human campaign. Meanwhile, Jean Grey returns to life, but her power is controlling her rather than the other way around. Overall, I was a little disappointed. 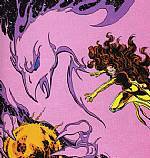 There were a few things I thought were cool, like Kitty Pryde fighting with her powers. I thought Beast was done well. I REALLY didn't like how things ended up for a number of characters, like Mystique, but as in the comics, I'm sure anything can happen down the road. I felt after the movie was over that between the two major storylines, the mutant cure and Dark Phoenix, I didn't get a complete story from either, just the highlights. I read the Dark Phoenix saga when it originally came out and her story is so much larger than this. Dark Phoenix deserved a movie focused on her. Bring her back this film, have her and Scott reconnect to emphasize the emotions and just show glimpses of what's to come for the next film. I don't think we need Magneto vs. Humans as a major storyline in every single movie.